Before attempting to climb the summit of Mt. Everest, most expeditions camp at the southern base camp of the mountain. The base camp is the furthest that travellers can trek without the use of mountaineering equipment. The approach route to this rudimentary campsite is surrounded by rocky ice and moraine of the Khumbu glacier. From the camp, one can catch photogenic views of higher peaks in the range as well as patches of the Khumbu icefall. The base camp is usually bustling with activity of the expedition teams in the spring season. • Complete the iconic trek to Everest Base Camp. • Climb up to an altitude of 17,500 ft in the Himalayas. • Visit Buddhist monasteries and tea houses. • Hike up the Kala Pattar mountain and Nangkartshang peak. Travellers are required to obtain adventure travel insurance that covers emergency high-altitude rescue and evacuation. Travellers are required to carry a copy of their travel insurance, a copy of their passport and 3 passport-sized photos. These documents are required to obtain the necessary permits. Travellers are required to adhere to instructions of the trek leader during the trek to Everest Base Camp. For cancellations made more than 20 days before departure of the Everest Base Camp trek: 70% refund. For cancellations made on or less than 20 days before departure of the Everest Base Camp trek: No refund. It is recommended that travellers have prior experience of at least one high-altitude trek in the Himalayas before booking this trek to Everest Base Camp. A high level of health and fitness is required to book this trek to Everest Base Camp. If you have any cardiac or respiratory conditions, or suffer from knee or spinal problems, please inform the tour operator and consult your doctor before booking this trip. Travellers who are not properly acclimatized to the high altitude may be vulnerable to experiencing acute mountain sickness during the trek to Everest Base Camp. The tour operator reserves the right to change or cancel the itinerary of this trip due to bad weather conditions or other unforeseen circumstances to ensure maximum safety of travellers and staff. Travellers are required to bear any additional costs arising due to such a change in itinerary. The tour operator takes utmost care to ensure safety of the travellers and shall not be held responsible for any mishap, accident or loss of life during the trek to Everest Base Camp. Land at the Tribhuvan International Airport in Kathmandu and get transferred to a pre-arranged hotel in the city. In the evening, you'll meet with your trek leader for a quick briefing session regarding the weather, itinerary and equipment for the trek ahead. Overnight at Kathmandu in hotel rooms. Transfer back to the Tribhuvan International Airport for a 35-minute, domestic flight to the Tenzing and Hillary Airport at Lukla. On arrival, you'll meet the support staff of porters and cooks that will accompany you during the trek. As the support staff prepares for the trek, you can explore the small village of Lukla and then begin the trek to Phakding. A relatively easy trail, you'll descend to trek alongside the Dudh Kosi River. Overnight at Phakding in guesthouse. 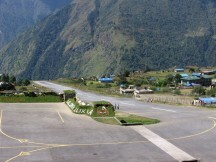 The runway at Tenzing and Hillary Airport at Lukla. The trail to Namche Bazaar, today's destination, continues alongside the banks of the Dudh Kosi. Along the way, you'll cross the river multiple times over long, suspension bridges decorated by prayer flags. You'll make a brief stop at the entrance of the Sagarmatha National Park to complete the paperwork and resume the trek to Namche Bazaar, the gateway village of Mt. Everest. Overnight at Namche Bazaar in guesthouse. 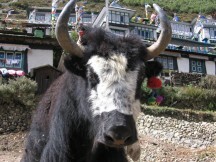 Yaks at the town of Namche Bazaar. Spend the day at Namche Bazaar to acclimatize to the lower levels of oxygen in the thin air. You'll undertake a short walk to visit the Sagarmatha National Park's museum at the village and the popular Everest View Hotel. Overnight at Namche Bazaar in guesthouse. Views of Mt. Thamserku from Namche Bazaar. Trek uphill to an altitude of over 12,500 ft to the village of Tengboche. The trail continues to follow the waters of Dudh Kosi, fed by melting glaciers higher up in the Khumbu valley. Tengboche is home to one of the largest monasteries in the region. In the evening, you'll visit the monastery to attend a prayer ceremony and view a 20-foot tall statue of Buddha. Overnight at Tengboche in guesthouse. The Tengboche Monastery, one of the largest in the Khumbu Valley. Walking across spectacular views of mountains like the Ama Dablam and Lhotse, you'll continue the trail to Dingboche. Along the way, you'll cross the village of Debuche and take a swinging, suspension bridge over the Imja Khola river. Even as the trail descends for a short period initially, it resumes to take an uphill route until Dingboche. Trek with a slow and steady pace with frequent stops to rest in order to minimize effects of the high altitude. Overnight at Dinboche in guesthouse. Spectacular views of Mt. 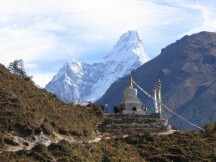 Ama Dablam to fluttering prayer flags. Take another day to rest and acclimatize to the thinning air at Dingboche. After a morning trek to the Nangkartshang peak just above the village, you'll spend the rest of the day at leisure. Overnight at Dingboche in guesthouse. Trekking on narrow trails to views of Mt. Pumori. Make your way alongside the moraine and ice of the Khumbu glacier. By now, the dense greenery seen during initial days of the trek will have disappeared. Instead, the landscape will be entirely barren with giant boulders and patches of glaciers adorning the trail. Trek with a slow and steady pace with frequent stops to rest in order to minimize effects of the high altitude. Overnight at Lobuche in guesthouse. Sunrise views from the village of Lobuche. Today, you'll trek to the promised land of the Everest Base Camp. In the spring, the base camp will be bustling with expedition teams preparing for an attempt on the summit. This is the furthest you can trek on the slopes of Mt. Everest without the use of mountaineering equipment. After a prolonged trek along the Khumbu glacier, you'll arrive and spend some time at the base camp. Return a short distance away from the base camp to Gorak Shep, a small village at the base of the Kala Pattar peak. Overnight at Gorak Shep in guesthouse. The Mt. Everest peak, highest in the world at 29,028 ft.
Wake up in the early hours of dawn and begin hiking up the slopes of Kala Pattar. After climbing on one of the most challenging routes of the trek, you'll catch a breathtaking mountain panorama of the surrounding peaks including Mt. Everest. Trek down to the base at Gorak Shep and continue onward to today's destination of Pheriche. Overnight at Pheriche in guesthouses. En route to Pheriche, views of Mt. Everest in the background. Continue the descent back from Pheriche. En route, you'll pass the villages of Dingboche and Tengboche before arriving at Namche Bazaar. The effects of high altitude reduce considerably as you trek to lose altitude. Overnight at Pheriche in guesthouse. A chorten near Namche Bazaar. Retrace your steps back to the village of Lukla, completing the trek to Everest Base Camp. After a short trek to Lukla, spend the day at leisure, celebrating the end of the trek with your fellow trekkers. Overnight at Lukla in guesthouse. The forest covered Khumbu Valley from Lukla. Take a 35-minute flight back from Lukla to Kathmandu and transfer to a hotel in the city. Spend the rest of the day at leisure. You can visit the local marketplace to shop for souvenirs and gifts or relax in your hotel. Overnight at Kathmandu in hotel rooms. 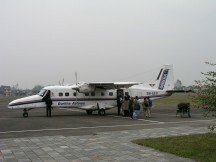 Take a flight back from Lukla to Kathmandu. Transfer to the Tribhuvan International Airport and depart for your next destination. Your trip ends here. Overnight at Kathmandu in hotel rooms. Arrive at Kathmandu and spend the day at leisure. You'll be accommodated in standard rooms in a three-star hotel on twin-sharing basis. Since no meals are included in today's package, you'll need to spend extra to have meals at any of the restaurants in Kathmandu. Overnight at Phakding in guesthouse. Travel to Lukla via a 35-min, domestic flight. You'll need to pay extra luggage costs if you desire to carry items exceeding 15 kgs. After the first trek of the trip to Phakding, you'll be accommodated at Phakding in guesthouses on twin-sharing basis. If unavailable, accommodation may be changed to dormitory-style rooms on multi-sharing basis. Today's meal package includes breakfast, lunch and dinner. Overnight at Namche Bazaar in guesthouse. Trek to Namche Bazaar, the gateway to Everest and the last town on the trail to house ATMs, cafes, shops, bakeries, banks and several facilities. You'll be accommodated at Namche Bazaar in guesthouses on twin-sharing basis. If unavailable, accommodation may be changed to dormitory-style rooms on multi-sharing basis. Today's meal package includes breakfast, lunch and dinner. Take a day to acclimatize to the high altitude at Namche Bazaar. You will be accommodated at Namche Bazaar at the same guesthouse as yesterday. Today's meal package includes breakfast, lunch and dinner. Overnight at Tengboche in guesthouse. Make the trip from Namche Bazaar to Tengboche and visit one of the largest monasteries in the Kumbhu Valley. 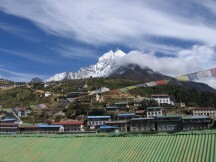 You'll be accommodated at Tengboche in guesthouses on twin-sharing basis. If unavailable, accommodation may be changed to dormitory-style rooms on multi-sharing basis. Today's meal package includes breakfast, lunch and dinner. Overnight at Dingboche in guesthouse. Continue trekking from Tengboche to Dingboche. You'll be accommodated at Tengboche in guesthouses on twin-sharing basis. If unavailable, accommodation may be changed to dormitory-style rooms on multi-sharing basis. Today's meal package includes breakfast, lunch and dinner. Take a day to acclimatize to the high altitude at Dingboche. You will be accommodated at Dingboche at the same guesthouse as yesterday. Today's meal package includes breakfast, lunch and dinner. Overnight at Lobuche in guesthouse. Resume trekking amidst the rocky ice and moraine of the Khumbu glacier and head towards Lobuche. You'll be accommodated at Lobuche in guesthouses on twin-sharing basis. If unavailable, accommodation may be changed to dormitory-style rooms on multi-sharing basis. Today's meal package includes breakfast, lunch and dinner. Overnight at Gorak Shep in guesthouse. After a week of trekking, you'll visit the Everest Base Camp and return to Gorak Shep. You'll be accommodated at Gorak Shep in guesthouses on twin-sharing basis. If unavailable, accommodation may be changed to dormitory-style rooms on multi-sharing basis. Today's meal package includes breakfast, lunch and dinner. Overnight at Pheriche in guesthouse. Retrace your steps to the village of Pheriche. You'll be accommodated at Pheriche in guesthouses on twin-sharing basis. If unavailable, accommodation may be changed to dormitory-style rooms on multi-sharing basis. Today's meal package includes breakfast, lunch and dinner. Descend to lower altitudes on a downhill trail to Namche Bazaar. You'll be accommodated at Namche Bazaar in guesthouses on twin-sharing basis. If unavailable, accommodation may be changed to dormitory-style rooms on multi-sharing basis. Today's meal package includes breakfast, lunch and dinner. Overnight at Lukla in guesthouse. Complete the trek to Everest Base Camp as you return to Lukla. You'll be accommodated at Lukla in guesthouses on twin-sharing basis. If unavailable, accommodation may be changed to dormitory-style rooms on multi-sharing basis. Today's meal package includes breakfast, lunch and dinner. Board a domestic flight to Kathmandu and spend the day at leisure. You'll be accommodated in standard rooms in a three-star hotel on twin-sharing basis. Today's meal package includes breakfast only. However, you can spend extra to have meals at any of the restaurants in Kathmandu. Check-out and transfer to the Tribhuvan International Airport. Today's meal package includes breakfast only. However, you can spend extra to have meals at any of the restaurants in Kathmandu. 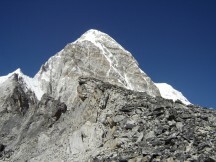 The tour operator will arrange your transport to the start point of the Everest Base Camp trek.